Max’s Proprietary Riboceine™ Technology For The Ultimate Glutathione Enhancement. Although scientists have known for decades about the health benefits of glutathione, the challenge has been how to safely and effectively increase glutathione levels. Up to now, methods of increasing glutathione levels have not been efficient in elevating glutathione to optimal levels. RiboCeine solves this problem of how to increase glutathione levels by providing cysteine, a fragile amino acid necessary to produce glutathione, in a patented formula that can be absorbed through the digestive system. RiboCeine has been the subject of twenty two published, peer-reviewed scientific studies that were funded by the National Institutes of Health and other scientific institutions. These studies have shown RiboCeine’s effectiveness in increasing glutathione levels and effectively fighting against the effects of oxidative stress. RiboCeine is based on 25 years of scientific research and was developed by the world-renowned research scientist and medicinal chemist Herbert T. Nagasawa, Ph.D.
RiboCeine is the foundation of Cellgevity because of how it effectively delivers cysteine. 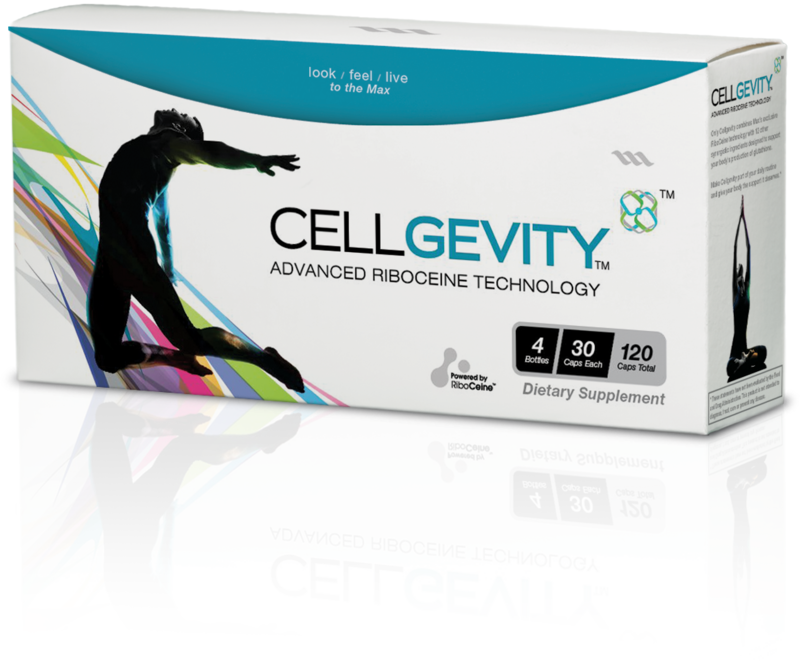 To better support this process, Cellgevity includes 12 science based ingredients that support the production of glutathione and all its multifunctional roles of protecting the cells, organs, and tissues. Cellgevity is a synergistic blend of RiboCeine combined with twelve additional ingredients to form Max International’s most effective health supplement. Includes a powerful source of curcumin that has been scientifically shown to have a 29% improved bioavailability than common sources of curcumin. The broccoli seed extract chosen uses the highest concentration of the active ingredient sulforaphane glucosinolate and is the same product used in the studies at the Johns Hopkins University School of Medicine. Employs BioPerine to enhance the bioavailability of key nutrients.